If you're like me you have never heard of, let alone tried microgreens. I had no idea what the heck they were until my sister invited me to go to a class at a local greenhouse with her. Having discovered recently that I can actually grow plants and not just kill them, I decided that this would be interesting. One of the first things that the instructor asked us is what we hoped to get out of the class, called 'Maximizing Microgreens'. My honest answer was "I want to learn what microgreens are...". Boy did I feel cool. This hour and a half class definitely taught me what microgreens are, and I found a new and exciting thing to devote my (nonexistent) spare time to. In a nutshell, microgreens are edible young plants that are grown from various veggies, herbs or other plant seeds. They range in size from 1-3 inches, including stem and leaves. 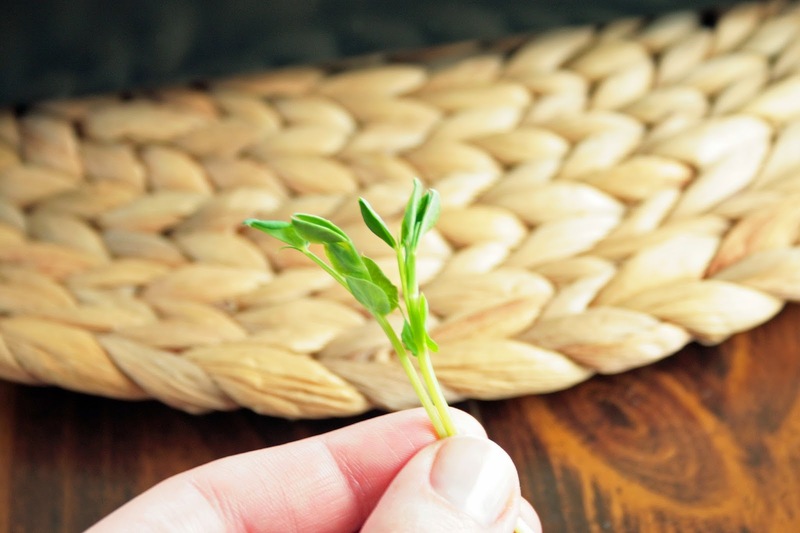 If you've ever grown anything from a seed, you know that the first thing to sprout is two little leaves that often don't look like the leaves of the mature plant. The picture below shows a microgreen versus a more mature plant. The 'microgreen' is on the left, and the right is the more fully grown plant (tomato plant in this case). 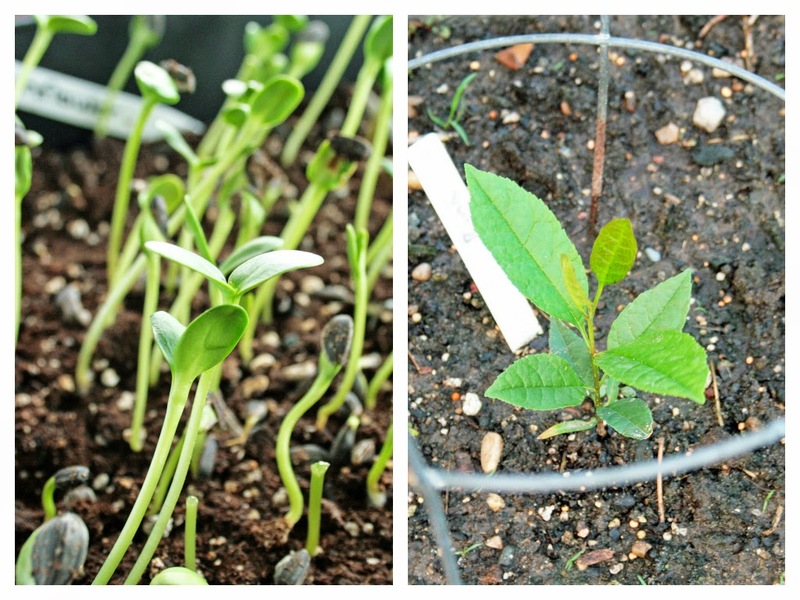 Those little leaves in the left picture are called "cotyledon" leaves, which is what you eat. These little plants are very easy to grow - no green thumb required. You can cultivate them in any sort of shallow container (plastic containers from restaurant leftovers work great!). Make sure there's some drainage holes on the bottom of the container. 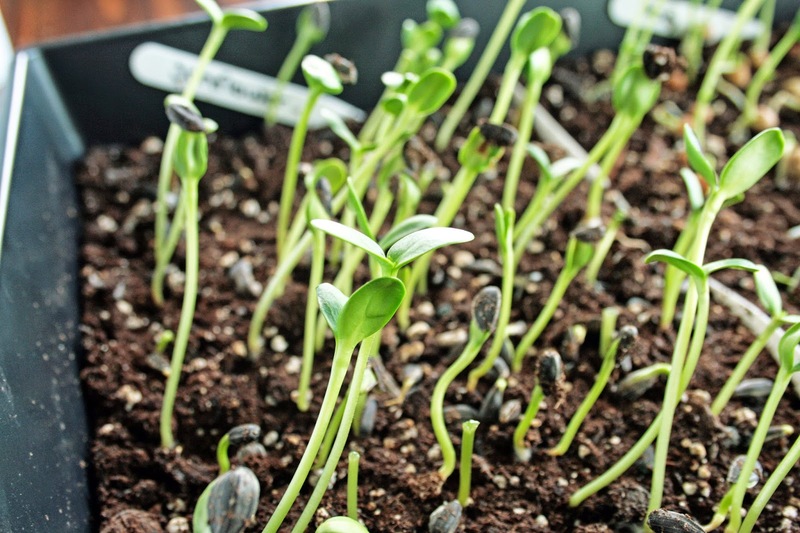 Just evenly spread some moist (not soggy) potting or gardening soil about 1-2 inches deep, pat it down some, and scatter your seeds on top of it. You can also pat down the seeds somewhat, but there's no need to bury them since microgreens don't need/have much of a root system. 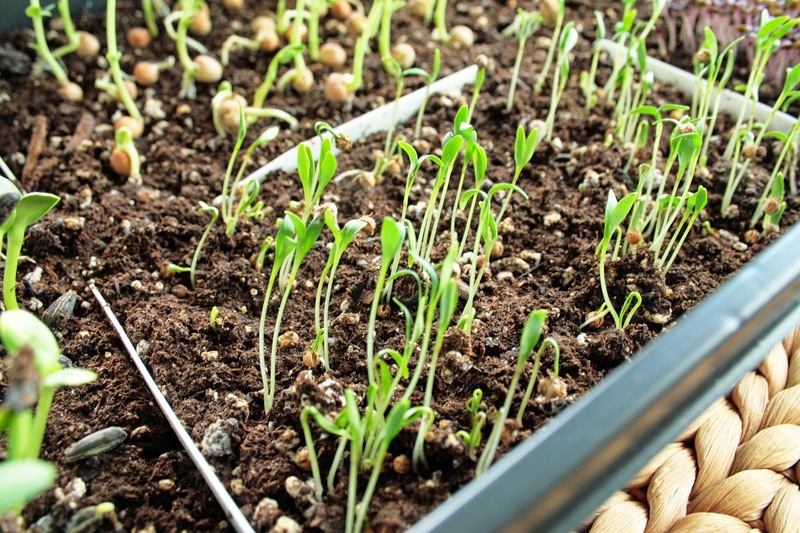 Make sure that the soil stays moist, and in a couple days you should see your seeds start to sprout. They don't really need much sunlight to grow into the cotyledon leaves, so no worries if you don't have a spot with direct sunlight to put your tray. Our instructor recommended having 2-3 trays of microgreens that you plant one week apart. That way you can continually have a rotating harvest going. Once you've eaten your greens, just replenish the soil and start over. 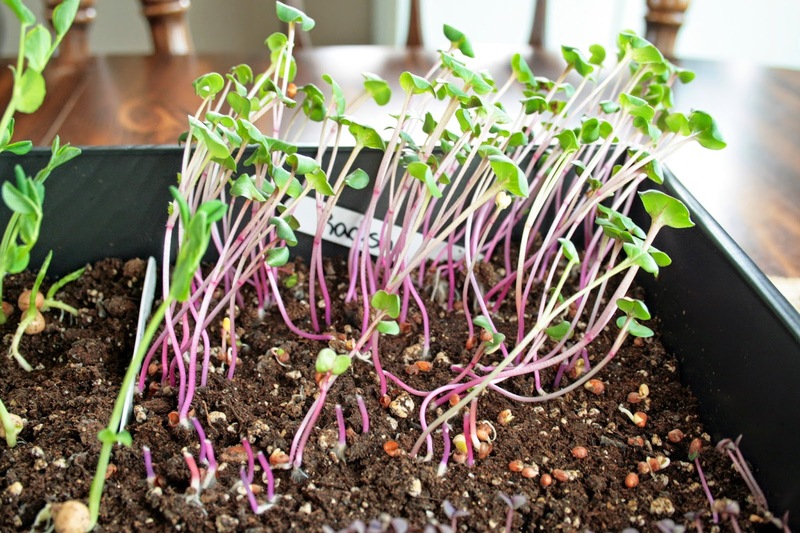 Microgreens typically take 10-14 days to grow. 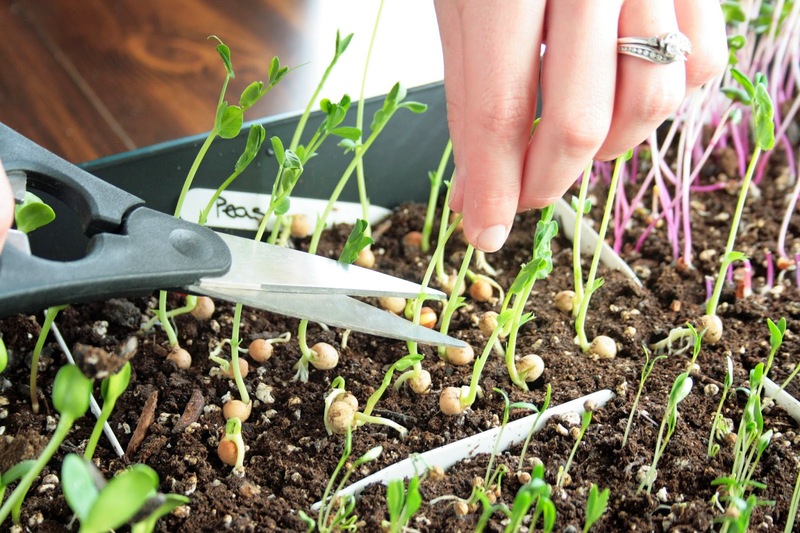 To harvest them, you simply cut the stems of the plant with the cotyledon leaves just above the soil. You can eat these just the way they are! Weird, huh? You can use microgreens in a variety of ways. Eat them right from your little garden, or put them on salads, in soups, or on sandwiches. You can also get creative with putting them on dishes or maybe sauteing them. Be creative! If you're wondering what's so great about microgreens, its that they are said to pack a pretty significant amount of nutritional value. A study done in 2012 by the University of Maryland's Department of Nutrition and Food Science indicated promising potential that microgreens may have a particularly high nutritional value compared to mature veggies. So not only are they easy to grow, they're actually really good for you! 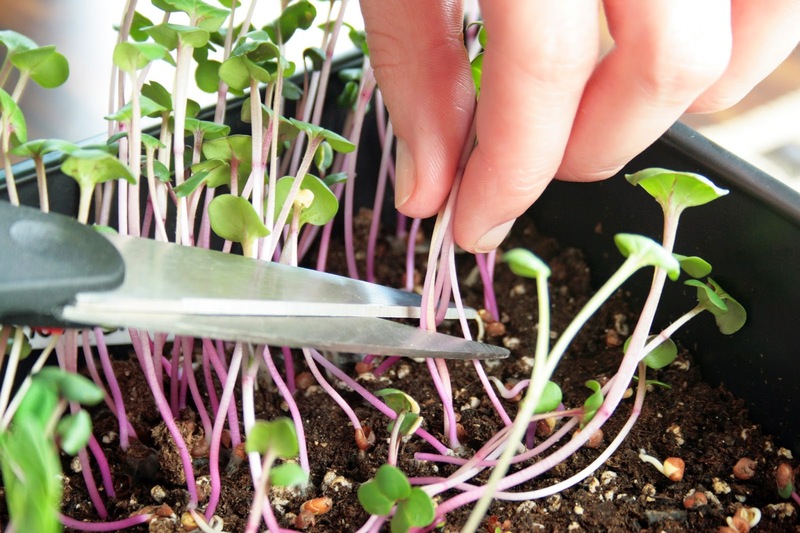 Just about any herb or veggie seed can be used for microgreens. We planted a few varieties from our class including: cilantro, radish, sugar snap peas, sunflowers and purple basil. A great place to check out is Johnny's Selected Seeds. They have a great selection of microgreen seeds and are reasonably priced too. So far, the sunflower microgreens are my favorite since they were quite mild. The radish micros were actually pretty spicy, just like a radish, and the cilantro tasted like the herb, but a little milder. That's the fun part about starting out with no microgreen experience - trying out the different varieties. I've enjoyed growing and munching on my microgreens so far, and I think I am going to keep a small indoor microgreen garden going. This is such an easy way to add some extra nutrition and flavor to dishes, so why not? 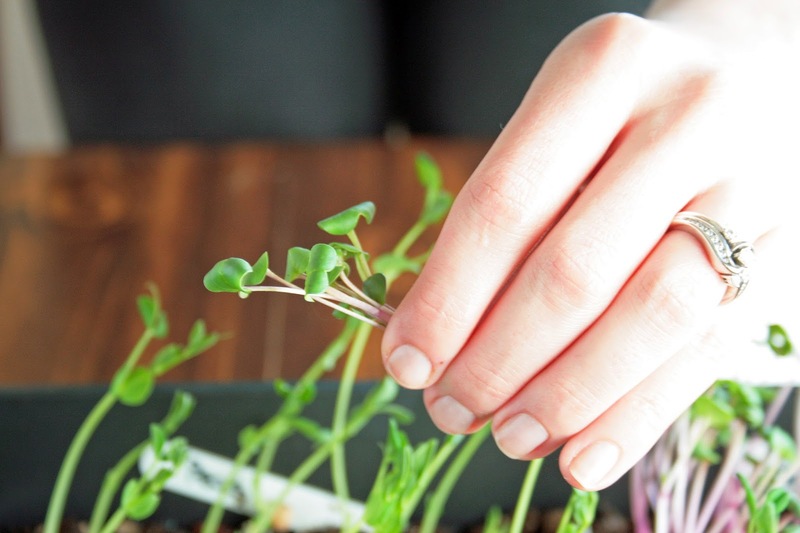 Do you grow microgreens already, or is this something you think you might give a try? Let me know your thoughts in the comments!